Mick Fanning has looked good so far at Snapper Rocks. HE'S at ease with his decision to retire from the world tour next month but Mick Fanning is showing great reluctance to being sent to the sand in his farewell event at his home break, the Quiksilver Pro. 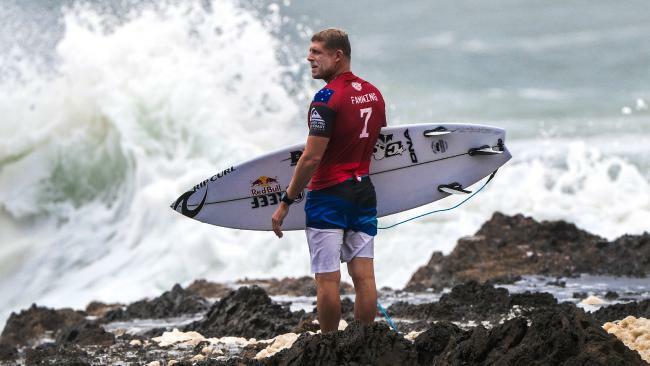 In what could have been his last surf at the event in 17 years of competition at Snapper Rocks, Fanning instead advanced into the fourth round of the World Tour event on the Gold Coast on Wednesday. Fanning defeated American danger Connor Coffin 11.67 to 7.37 to stay in the race for victory in the season opener. The win ended two years of early exits at the tournament for the three-time world champion. Fanning has elected to end his world tour career at the Rip Curl Pro at Bells Beach next month, the venue he won at as a teen wildcard 17 years ago. In round four Fanning will now come up against Owen Wright who kept alive his bid for a memorable start to the 2018 season with his emphatic 14.50 to 9.04 victory over Brazilian William Cardoso. Wright last year won the Quiksilver Pro on his return to the world tour after a year out rehabilitating from a serious head injury. This year Wright says he is in much better shape mentally and physically and has his sights set on improving his world ranking of six.